“You are clearing, transmuting, and cleansing parallel lives to become non-attached. If this is your wish to move into the long ago forgotten ethereal light form it is best to be non-attached to all that transpired upon taking on dense form. We the Lemurian Council Of Twelve know this is not an easy task for humanity. It is because of this that many humans, as souls, did not choose this transformation at this time. 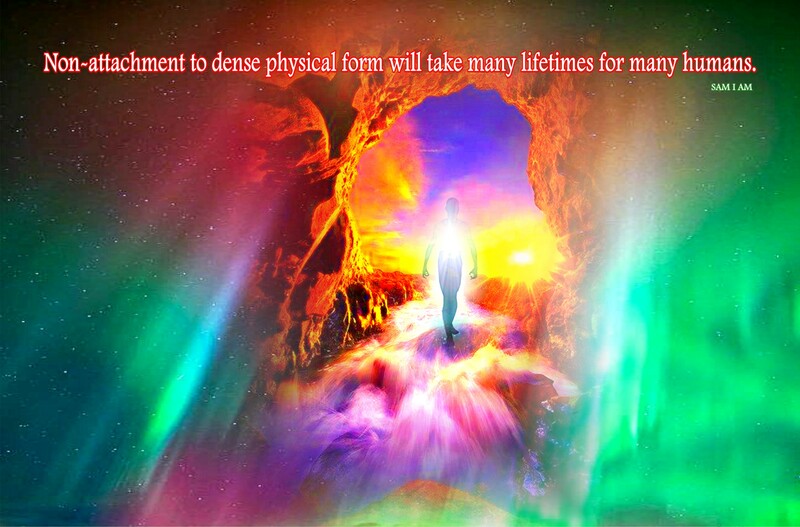 “The non-attachment to dense physical form will take many lifetimes for many humans. But for those few that have chosen to move through this process, in this life, we salute you, knowing it was not an easy soul choice. It is not an easy human choice. And yet, to leave these attachments behind serves the ethereal form by maintaining its purity and Oneness. For recall please, in ethereal form all are already connected, all are already, as you would note, attached. And yet, there is no attachment to singular, separate forms. For in the ethereal form, all are recognized as parts of one another, aspects of All That Is. All in this state of being are aware of their unique attributes adding to the Wholeness of the One Thing in which all reside. And yet, as ethereal beings it is known there is no separation among you. “So now we return to those of you in human form and we ask, ‘Is this necessary process yet another movement you as a human wish to make?’ Consider your attachments if so. Consider your attachments and continue or begin to free them, to let them go. This does not mean you must step away from anyone in your life, nor in parallel lives. We ask only that you use your resonance and your discernment to attract like energies, for moving into this process will become most cumbersome if still attached to the drama of duality. 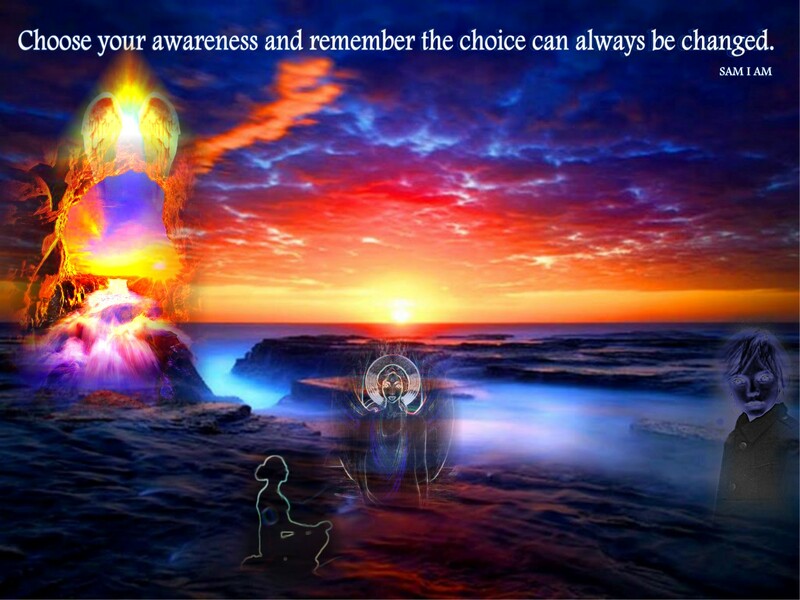 “Behaviors will change with these downloads of Light, Consciousness/Energy. These behaviors will change with those taking on the Light as well as those not assimilating the Light so effectively or efficiently. Humans unaware of the process do not assimilate the Light as effectively or efficiently. Those not choosing to undergo the process will return to the New Earth to assimilate the process at other times in humanity’s awareness. “Yes, in your small mind of one, all is illusion, as in the Course (A Course In Miracles), and yet as you move through this illusion, is it not easier to know these things to help you move through them more smoothly and fluidly? This is the question we ask the channel as she continues to repeatedly question. “Know, assimilating these energies are best done as discussed in previous channels. Rest is of the utmost importance as is hydration and a lighter diet. The exercise is not as important as these waves are coming though for the body is taxed to the utmost adjusting with these waves. The mineral composition of the body is changing drastically and of course, many are requiring additional minerals, magnesium to be specific. There are other minerals and requirements the human form takes on as these changes coalesce more fluidly on the earth. Each is guided in its own way. “We, the Lemurian Council Of Twelve, will continue to be with those who wish to be guided. Remember, all here now were on, in, the consciousness of Lemuria. The true state of humanity is not a dense human form as it is now; that form is finally moving back to the form we held as true Lemurians. Know that as this process unfolds, those wishing to move though it will move through it with more fluidity and grace when seeking the guidance of their own unique aspects. “We are with you now as you move through these changes. The progress is steady and smooth for some and not so steady and smooth for others. The earth changes rapidly and along with these changes the human psyche, consciousness, changes as well. Knowing all is one, knowing all is, after all, illusion in your mind of one, the small one, it is still of the utmost importance to continue the practices of holding and building the lightbody. These practices are much more easily done when one is with ones self rather than in groups of uninformed people. “Each human has chosen its path carefully as a soul and now is the time that many souls step away from their families, from the group consciousness in which they were raised and believed to be true, to move into their own state of increasing awareness of the Oneness of all life. This Oneness is not an illusion. This Oneness is of All That Is and ever will be, and this Oneness does not change. As the human form takes on more of the attributes of the lightbody, it becomes necessary to achieve awareness of this Oneness. “This Oneness will help all as moving through these changes progresses more smoothly and fluidly for those that know the truth. Ye are gods in human form and that human form continues to change at a steady rate with these waves of consciousness entering the earth’s atmosphere. This step towards Oneness is a necessary process to move though the bodily changes fluidly, progressing at a state unheard of on any level of awareness. 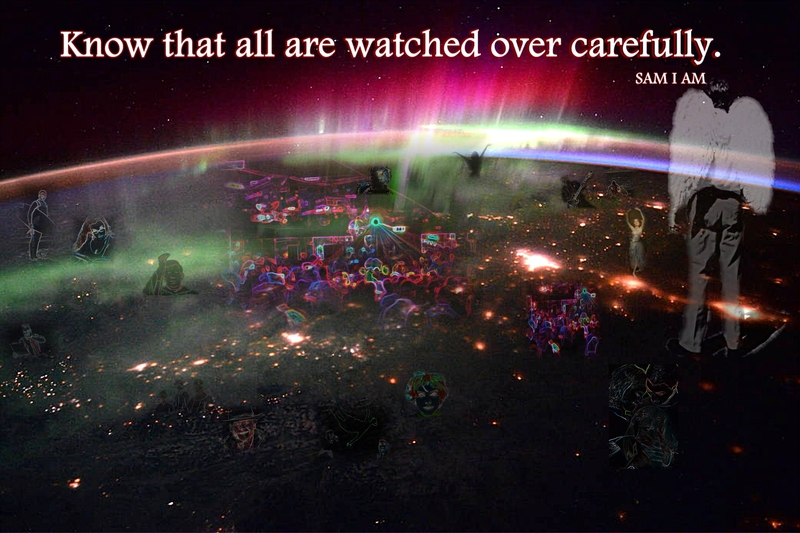 “Know that all are watched over carefully. Know that all, each form is guided. 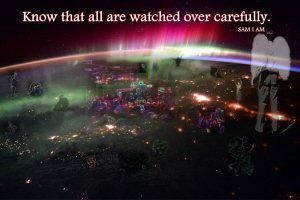 It is only in the small mind of one that chooses not to listen to the guidance received, not to believe the guidance received, that one continues to enter the field of mass chaos, which is now upon your earth. Know that all those who listen to the guidance within, all those who have honed their human body to the point where only Love and Light can enter, will continue to be guided through this process with smooth and steady progress. The Oneness of which you seek is already yours and we cannot stress enough to remain within that Oneness of the small self and within that awareness that ye are human gods in matter, now changing the course of humanity in an unheard of way.